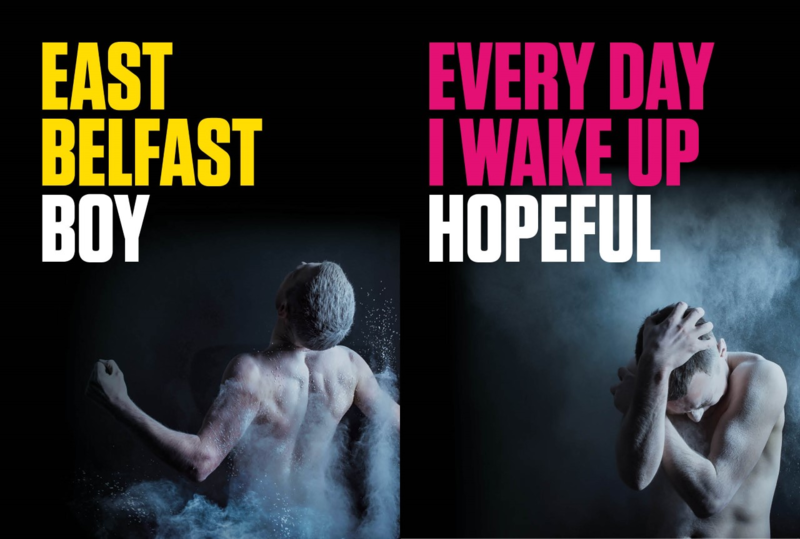 Prime Cut Productions continues their all-Ireland tour of critically-acclaimed theatre double bill, featuring Fintan Brady’s East Belfast Boy, and John Patrick Higgins’ Every Day I Wake Up Hopeful. The double bill will run until 20 February 2019, to venues in Belfast, Roscommon, Cork, Letterkenny, Castlebar, Limerick, Armagh and Dublin. Following the overwhelming success of Prime Cut Productions internationally award-wining production of Stacey Gregg’s Scorch (including, The Scotsman Fringe First 2016, Irish Times Theatres Award Best New Play 2015, Adelaide Fringe Best Theatre and Critics Choice Award 2017) and four wins at the 2018 Irish Times Theatre Awards for Red (including Best Production, Best Direction, Best Actor and Best Set Design), this double bill explores the complexities of male mental health in contrasting performative styles. Meet Davy. The things he sees. His streets. His mates. His girl and…the boys. With pumping techno, pulverising movements and street sharp poetry, East Belfast Boy is a rollercoaster ride and a cliché-free zone. Written by Fintan Brady, East Belfast Boy is a thrilling spoken word show by Ryan McParland, and set to an original soundtrack by internationally acclaimed DJ, Phil Kieran, with choreography by award-wining dancer, Oona Doherty. East Belfast Boy was originally created by Partisan Productions through a collaborative process involving young men from the Beersbridge and Newtownards Roads in Belfast. It was first presented at Ballymacarrett Friendship Centre in 2015, as part of the Eastside Arts Festival. East Belfast Boy garnered critical acclaim at EdgeFest, and Edinburgh Festival Fringe during 2018. Written by John Patrick Higgins, Every Day I Wake Up Hopeful is a heartbreakingly funny and powerful story about Malachy, a man facing an epic mid-life crisis, starring Simon O’Gorman and directed by Rhiann Jeffrey. Every Day I Wake Up Hopeful is John Patrick Higgins’ first play with Prime Cut Productions.